It seems like after a certain age, we are not allowed obsess over “cute” stuff, in fear of others calling us immature. Unfortunately, as I am one step away from turning 30, I am entering that stage of life where I can no longer hang cute fluffy balls on my bags, or switch out my overly exaggerated phone cases every two weeks. Fortunately, I have a younger sister, who happens to love everything that’s pink, girly and squishy. So, by association, I feel a little better channeling my kiddy side when I’m with her. I don’t really understand the craze about animes and cartoons, but I do know I overuse Gudetama emoticons. I also get stuck at the Gudetama shops all too often during my trips to Japan. I don’t like to admit it, but I think I am into this lazy & grumpy egg yolk. 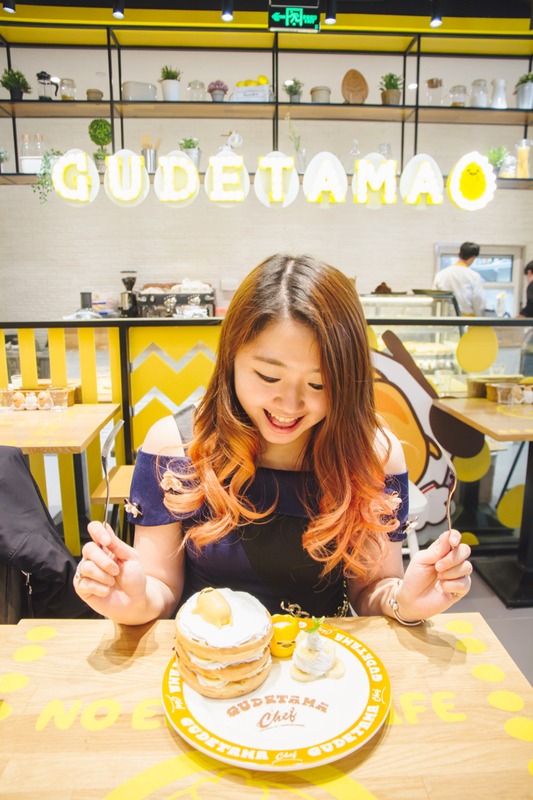 The Gudetama restaurant just opened in Shanghai, and I invited my sister to join me on the adventure before the grand opening. If you want to read more about my sister Michelle, scroll to the bottom for a short bio! I was expecting the restaurant to be somewhere in the boonies, but to my complete surprise, it’s located in the heart of Jing-an, at the Crystal Galleria mall! Once you get to the LG1 floor, just look for the yellow photo wall, then you’ll find the restaurant! Reservations are recommended (don’t underestimate the egg fever, guys). The restaurant has a main dining area plus two small rooms. No matter where you decide to sit, you’ll be surrounded by Gudetama. Your table, chairs, lights….all the decors and details are not to be missed! Honestly, my expectation for the food was not high. Let’s be honest, most themed restaurants don’t serve the best food, since most people are there for the photos. 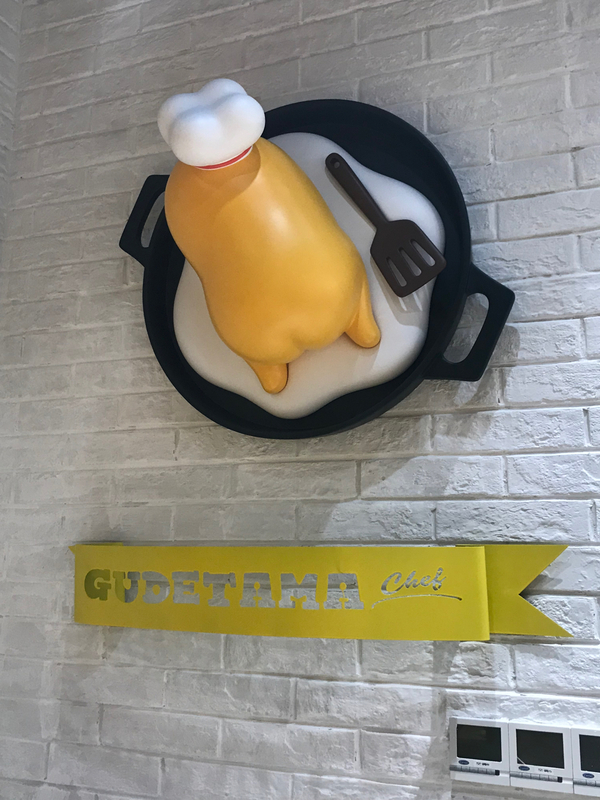 I have to say, though, the food at the Gudetama Restaurant was not bad. 7/10 on most dishes! And I’m a harsh critic when it comes to food. And since all dishes come with the Gudetama touch, that adds 2 extra points to the score and brings it to a 9/10. The menu is a mix between East and West. Most Asian dishes are either Thai or Japanese, and most Western dishes are Italian. We were craving Asian food on that day so we focused on that part of the menu. 鱼饼 Fish Cake (¥42) is decent and especially flavorful with the dip. A great appetizer to start the meal! Already exceeding my expectations for a theme restaurant. 木瓜色拉 Papaya Salad (¥38) tastes great as well, but it’s a bit too salty and spicy for my liking. There was a Gudetama on the dish to take my complaint away. 冬阴功浓汤 Tom Yum Kung（¥68）comes in a generous portion that can be shared amongst many people. Even though I wouldn’t say the soup is the most authentic, it is still decently made. 蛋黄哥招牌鸡腿丼饭 Chicken Leg Don(¥48) was probably my favorite dish of the night. Highly recommended! 蛋黄哥火山烧肉丼饭 Roasted Pork Don（¥48) was another crowd favorite. Maybe my next visit, I’ll stick to ordering all the rice bowls. And can we take a minute to talk about how cute the grumpy Gudetama looks surrounded by all the meat? 大虾膏豆腐煲 Tofu Pot with Shrimp Paste（¥38）is the perfect dish on a gloomy, cold night. And I can’t say no to any tofu dishes. The twin eggs in the middle of the pot adds another playful touch. 黄咖喱牛腩 Yellow Curry with Braised Beef（¥58）falls flat compared to the other dishes. It’s not quite Thai and not quite Japanese. 日式猪排饭 Tonkatsu Don（¥48) could be better in terms of the texture of the meat. I am quite picky when it comes to be tonkatsu though…. The curry-flavored rice that is shaped like a lazy Gudetama is so adorable! 腰果炒鸡肉 Stir Fried Chicken with Cashew（¥48) is another one of my favorite dishes of the night. Flavorful with just enough spice. 蛋黄哥鸟巢鸡蛋糕 Eggy Sponge Cake（¥38）I haven’t had this dessert in forever! Let me know if I’m wrong, but I’m pretty sure you can only get this in Taiwan, on the streets. It’s something I ate growing up, so I had to get the Gudetama version of it! Somehow, the Gudetamas look like they’re praying or doing a ritual of some sort. Cute but slightly creepy? The cake is slightly crunchy on the outside, and fluffy on the inside. It smelled and tasted eggy and buttery. Better with the jam on the side! 香蕉巧克力松饼 Banana & Chocolate Pancake（¥48）We totally ordered this for the looks. I mean, how cute does this look?! The taste is not bad as well, but the pancake is slightly dry. Since launching the WeChat official account last month, I’ve had people marvel at my skills at putting together bilingual contents in Chinese and English. Guys, I am not that perfect, ok? Although I don’t have an editorial team or an agent, I do have my sister to help me do the editing, formatting, and translating. I want to take this moment to give her credit for the work! Michelle just moved to Shanghai from Vancouver, so you’ll be seeing more and more of her in my future posts as we often hang out and travel together!